I’m a recipe follower when it comes to cooking. I’ve never been successful at simply adding a dash here or a pinch there, and I find it difficult to identify individual flavors in a dish. My sister-in-law, however, is the complete opposite: she can sniff, taste, and generally eyeball a food and reconstruct it to perfection. J and her family have been visiting from Amsterdam. Earlier this week she encountered a kale salad at a local deli, and after tasting a small sampling and asking a couple of questions, she began working on her own version when she got back to our house. 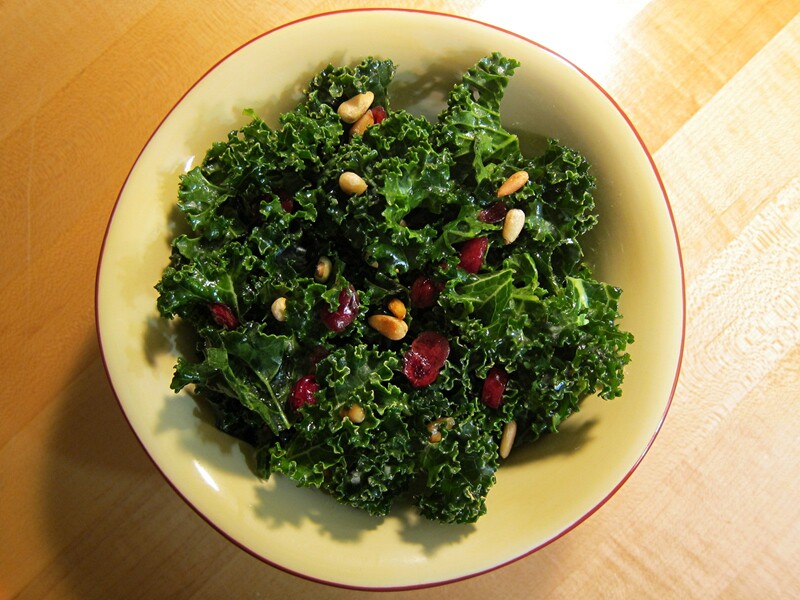 Fresh kale, olive oil, lemon juice, dried cranberries, and a few pine nuts… twenty minutes later, it appeared on the dinner table — simple, but oh so delicious. I’ve already returned to the store to load up on more ingredients… I cannot seem to get enough of it!